We are all familiar with Winners type games. You might know them as Queen/King of the Court. Perhaps you use the Speedball or Player variations. In all cases, the basic concept is those who win get to stay on, while the losers rotate out. The advantage to them is they tend to have a good tempo. And, because they are small-sided games, players get lots of touches. Coaches often use them as warm-ups, but they are good for much more than that! The fact of the matter is that you can adapt the Winners structure to work on specific parts of the game. In other words, you don’t have to just let the players play however they want. I’m not saying free play a bad thing. It’s just that sometimes more specialized work is required. We can adapt Winners games to do that. 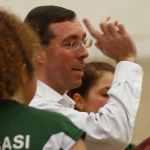 Let’s say you want your setters to set rather than passing and hitting. One way to do that is to have one setter per team and make sure they are out of serve receive. 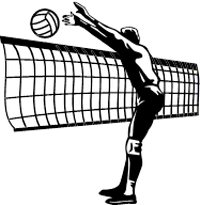 Another way to go is to put the setters on their own rotation separate from the rest. Say you only have two setters. They both stay on-court and flip back and forth between the winners and challenge courts based on whose team won the latest rally. If you have more than two setters, you can periodically sub out one or both of the fixed setters. Alternatively, you could have them rotate the same way teams normally rotate in Winners. By that I mean the setter whose team wins the rally goes to/stays on the winners side, the loser rotates off, and the next player in line rotates in to the challenge side. This positional rotation concept is something you can do with any position. Be aware of the fatigue factor, though. If you only have a 2-player rotation that means those players are in for every rally. If the game goes on for a while, they are likely to tire – especially middles. Also, make sure you don’t create a situation where the rotation(s) you set up result in fixed pairings. 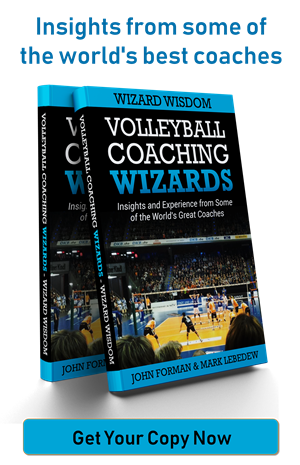 Think about a situation where you have 3 setters in a rotation, and three teams in the broader rotation. In that case, the setters could each end up just staying with one team the whole time. They wouldn’t mix around, depending on the rules. That said, there might be times when you do want fixed pairings. For example, you could put together Setter/Middle pairings that stay together so they can practice working in tandem. Another way you can adapt the winners concept to work on specific game elements is to change the specifics of the court. By that I mean you can narrow and/or shorten it. Alternatively, you can designate part of the court as out-of-bounds. Aside from putting a higher premium on control and increasing rallies, making these kinds of changes can have some useful benefits. Narrowing the court, for example, encourages more blocking, especially if you require multiple front row players. That tends to lead to more blocks, which makes hitter coverage important. It also gives the hitters a chance to work on using the block, not just trying to hit around it. Designating part of the court as out-of-bounds does a couple of things. First, it means you don’t need to have someone there to defend, so you can have fewer players on the court. For example, in triples you can have two blockers at the net and just one defender if they don’t have to cover the whole back court. Second, it means the attackers must problem-solve. How can they be successful without attacking to that zone? If there’s something specific you want to work on, you can require teams to do that as part of the game. A simple example is something like requiring a high ball swing on the the first attack. If you want to work on out-of-system offense, you can mandate the setter not take the second ball (if you have one on the court). Here’s something I’ve done with more advanced teams. Say you’re playing triples. On a good pass, the player who did not play the first contact must run for a quick set. The other perhaps runs a second tempo, or is simply the outlet. There are all sorts of things you can do with this to work on different parts of the game, or just to force players to think and problem-solve on the court. Related to requiring plays, you can also change up how you have the first ball initiated. In standard winners games it generally comes from a serve. If you want to work on something like your faster sets, then you want to encourage better passes in that initial phase. To do that you can make the first ball an easier one – perhaps a free ball or down ball. Then the rally would play out as normal. 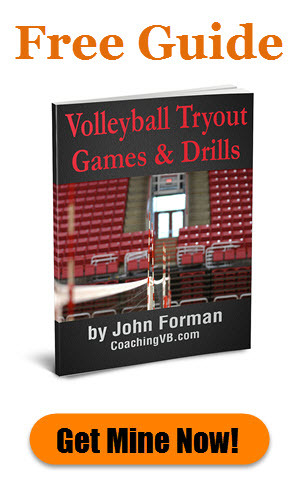 Or, in the case where you want to work on out-of-system play, you could have the first ball go to the setter. That would then force someone else to take second contact. And of course if you do keep a serve initiation, realize that each one of those balls is another serve reception repetition for your passers. Importantly, they are game-like repetitions, which are more valuable than ones done in basic drills. When I coached at Svedala in Sweden we had a smaller squad. That meant I could rarely go 6 v 6 in practice games. As a result, I used a lot of smaller-sided games to work on different elements of our play. Some of those games were based on the winners concept using the sort of variations outlined above. It was a useful way to keep the training as game-like as possible even when I had fewer players than I would have liked. You don’t need to have a small squad to use these winners variations, though. You could just as easily split your team over two mini-courts. Maybe they both work on the same thing. Maybe they work on different things. The point is, if you are creative you can set up all sorts of different situations to work on just about anything you like.